More than 100 "Chibok girls" freed from Nigeria's Boko Haram have been reunited with their families and will soon return to school. Women Affairs Minister Aisha Alhassan says they are now "fully recovered". The government says they are now "fully rehabilitated" and has promised to sponsor their further education. Ms Alhassan said: "They are going to be in one of the best schools, the American University of Nigeria, where they will start a special foundation programme like a pre-degree. "It's a very happy day. When the girls came out, they were so traumatised that they didn't even believe they were free. They are fully recovered, and they are very anxious to go to school." 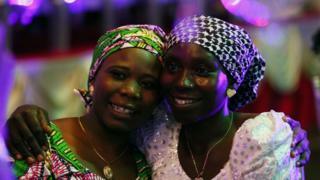 Chibok girls: What fate awaits the ones set free?